A story of pure love between the son of a man who runs a ship repair factory beset with financial troubles and the well-bred daughter of a national jewelry chain store owner. The backdrop of the story is Yokohama. If you feel you have lost the purity of your soul by watching stories about womanizers seducing impudent women, or by carrying out calculated maneuvers in your own love life, here is a story for you. A boy and a girl from highly different social backgrounds meet and fall in love. Their love, of course, faces a lot of obstacles. The setting is in Yokohama, a modern port city known for its romantic atmosphere. 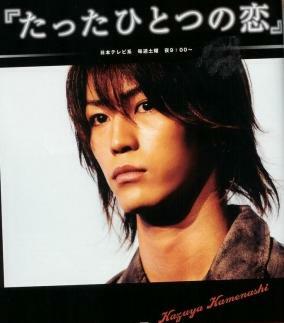 Hiroto Kanzaki (Kazuya Kamenashi) works hard every day and night for the survival of a small ship repair factory (inherited from his father) as well as the survival of his mother and younger brother, who is suffering from health problems. Living such underprivileged life, Hiroto has forgotten how to smile. In contrast to him, Nao (Haruka Ayase) is the daughter of a popular jewelry shop owner in a fashionable street in Yokohama. She attends a prestigious exclusive women's college and grew up cheerful and blessed with affluent love. From the moment Hiroto meets her, his closed mind slowly opens up to Nao, who is so innocent that she utters whatever she thinks. Their three close friends, who are also 20 years old's, play an important role in their developing relationship. The scriptwriter is Eriko Kitagawa, who earned the nickname "The Goddess of Love Stories." This classic love story enables those who are in the same generation to feel empathy, or be envious of the characters' lives; and the rest, who were once 20 years old's, to reminisce about their own "Love of My Life."